Macworld sent in a team of specially trained spies to uncover Tiger’s deepest, darkest secrets. Our second installment deals with Spotlight. From lost files to smart folders, our experts show you how to get the most out of OS X 10.4 ’s potent search tool. Tiger lets you save a Spotlight search query as a smart folder, which dynamically updates to include any files that match the search criteria. For example, you can create a smart folder that contains all the images you’ve opened in the past week (from the Finder, go to File: New Smart Folder, and set the first row of menus to Kind: Images and the second row to Last Opened: This Week; then click on the Save button). 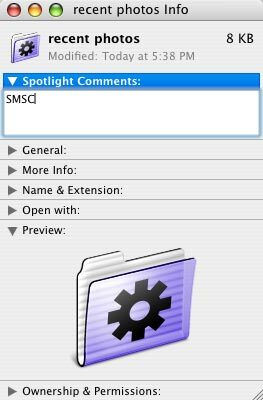 Get Smart For quick access to your multitude of smart folders, add a searchable Spotlight comment to each smart folder on your system. Just make sure you choose an obscure comment. Do you dislike Tiger’s default Find window? You want to search for a file name, so you press Command-F, only to be faced with the Kind: Any and Last Opened: Any Date search fields, forcing you to manually add the Name: Contains setting. If you miss the old way of doing things, here’s how to turn back the clock. ).While you’re at it, set the window’s size and position. When you’re done, click on the Save button, name the smart folder whatever you like (you’ll rename it later), and save it to your desktop. Switch to the Finder and navigate to /System/ Library/CoreServices. Control-click on the Finder entry, and select Show Package Contents. In the new window that appears, go to /Contents/ Resources. Drag the file named default_smart.plist to your Documents folder, or to any location other than your desktop. This will serve as your backup file, in case you need to restore the original file later. Leaving the Resources window open, press Command-N to open a new Finder window, navigate to your desktop, and rename the new smart folder default_smart .plist. Click on the Use .plist option when the Finder asks whether you’re sure you want to make this change. Finally, drag your new default_ smart.plist folder into the Resources folder. The Finder will ask for your admin password and will ask you to confirm that you want to overwrite the existing file. Once you’ve replaced the file, close the window. Some programs, including Microsoft Word and Excel, embed handy information (or metadata ) in files; this information aids Spotlight in its searches. For instance, Word and Excel automatically include the name of a file’s creator (as its author), and they guess at the document’s title. This information lets you search for files by creator, or by a title that isn’t part of the file name.